I love everything about children or taking care of elderly people. 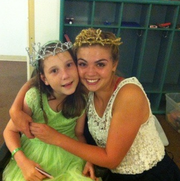 I was a camp counselor for special needs kids and adults over the summer for three months. it was a temporary job, I did personal care, supervision, and a great bond. I fell in love with it and it became a passion, so I would like to further my experience with continuing to working for what I love to do. I also worked at an outdoor science school with 5th, 6th, and 7th graders. I also had a babysitting job through care.com on Friday night, still do that every once in a while. I am CPR certified. Please contact me at kimberly_maaele@yahoo.com if you are interested, thank you.